Whenever you access a card with a trash cost not in Archives and do not trash it, you may reveal it and gain 1credit. Updated If the Runner uses Salsette Slums to remove an accessed card from the game, does Aeneas Informant trigger? Yes. The Runner accessed a card and did not trash it. Can the Runner use Aeneas Informant when accessing a rezzed card? Yes. Revealing the card is part of the effect and not a condition for using the ability. 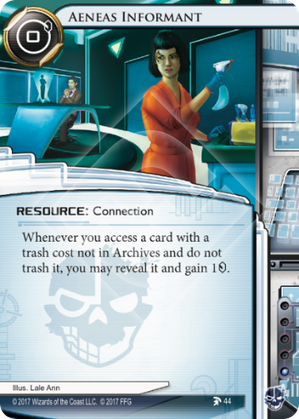 If the Runner has both Maw and Aeneas Informant installed, what happens if the first card accessed is not trashed or stolen? What if the card trashed by Maw is that already accessed card? Both Aeneas Informant and Maw meet their trigger at the same time, so the Runner chooses the order in which to trigger and resolve them. If the Runner chooses to trigger Maw first, and the card that was just accessed is randomly chosen to be trashed, then the Runner still gains 1. A really powerful card and I suspect one of the main reasons MCA Informant exists. What the informant does is make runs on assets without trashing them make credits. If you only have one informant that's simply a trade of a click for a credit. If you have two (or one and a Desperado) it's 2 per click, Magnum Opus territory. If you have all three out you generate a whopping 3 per run. Add Desperado and you can get up to 4. Add Temüjin Contract and things become really insane. Other decks do frequently run PAD Campaign as well though and even if the corp ices all their PAD Campaigns that probably makes it worth including 3 Aeneas Informants in our deck since it means the corp won't be able to put as much ice on other servers. But Aeneas Informant doesn't simply work on naked remotes. As a bonus it also kicks in when you dig through R&D or HQ. If a Legwork is unsuccessful at finding agendas but does see some assets Aeneas Informants let you get some of your money back, provided you don't trash the assets. At 1 influence shapers can get their own informants as well, which can be useful in an R&D dig. Just remember that you have to reveal a card to get the credit and thus give the corp some information about what's coming up for them. From a corp perspective Aeneas Informant is not all that easy to counter without the right cards. MCA Informant is an obvious and very effective silver bullet. Best Defense simply works as well. Can someone explain why Aeneas Informant doesn't proc with Salsette Slums , when Salsette Slums doesn't proc the abilities of Hostile Infrastructure and NBN: Controlling the Message ? If he's saying that using slums = trashing a card, then he's changing those interactions.